Help Center3. Integrations3.2 QGISHow to add layers in QGIS? How to import a KML into QGIS? How to import a shapefile into QGIS? How to add layers in QGIS? The Add Spotzi Layer dialog box opens, displaying a list of your datasets. 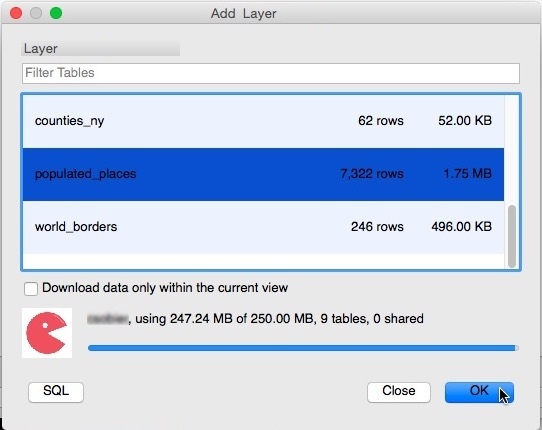 Your dataset is downloaded to your PC or Macbook and appears in the QGIS Layers Panel. From the Web Toolbar in QGIS click Spotzi Plugin and then Add SQL Spotzi LayerThe Add Spotzi SQL Layer dialog box opens, displaying a list of your datasets and the associated column names from each dataset. You can write and test SQL queries before adding the layer.Tip: You can use the QGIS filter option to open the Query Builder, if you need help creating an SQL query. Click Add LayerThe SQL layer is downloaded and appears in the QGIS Layers Panel.